Sometimes, you hate to be proven right about something, and that’s how I feel in the wake of the massacre of the police in Baton Rouge. Well, that future is here. 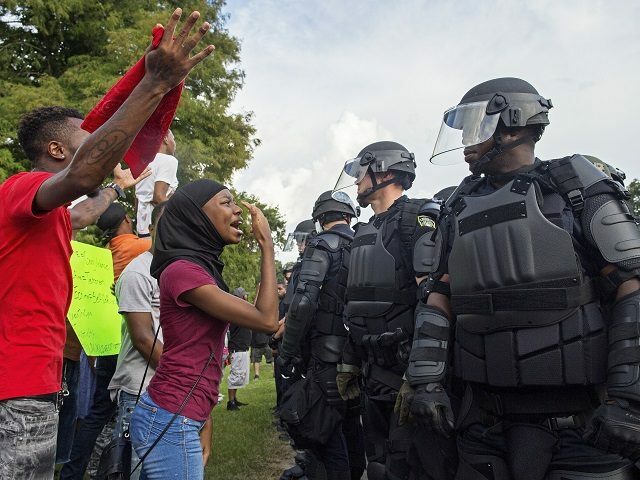 In Dallas, as well as Baton Rouge, it looks like the cops were wearing body armor, but as Breitbart’s A.W.R. Hawkins points out, body armor will typically stop a pistol bullet, but not a rifle bullet. And so, of course, determined cop killers are now firing rifles. Obviously, we are in an arms race: cops vs. criminals. Okay. Let’s confront that reality head-on and hereby highly resolve that we, the forces of order and civilization, will prevail. If it’s Us vs. Them, let’s choose Us. Fortunately, we have resources—we are smarter than they are. So in addition to whatever law-and-order measures we might need—and I’m for all of them—we also need a crash R&D program, so that armor once again is ahead of ammo. And as I wrote, no idea, no matter how blue-sky, should be off the table: not drones, not mobile deflector shields, not anything. Indeed, maybe we need an X-Prize. An X-Prize, of course, is a prize for the best new idea. The origins of the concept trace back to the early 18th century, when England promised big money to whoever could solve a critical challenge to naval navigation. This fascinating history was ably recorded a few years ago by Dava Sobel, author of the best-selling book, Longitude: The True Story of a Lone Genius Who Solved the Greatest Scientific Problem of His Time. More recently, the idea of a prize for applied genius was revived by an American, Peter Diamandis, who used the idea to incentivize private space travel; as is so often the case, the lure of money proved effective, and so, in 2004, a brief space trip happened, and the first X-Prize was awarded. Today, the X-Prize Foundation, based in Southern California, is offering X-Prizes for breakthroughs ranging from health data to carbon sequestration. They are all worthy missions. But now, mournfully, we see that there’s a new and more urgent mission—keeping our police officers alive. Of course, the money for an X-Prize has to come from somewhere. Three hundred years ago, the money came from the government; more recently, the money has come from private-sector visionaries. Yet either way, it has to be done, because this fight is not just for the Thin Blue Line. It is a fight for all of us.